Detroit Red Wings NHL sunglasses have the Detroit Red Wings name screen printed on one side of the frames and the Detroit Red Wings logo on the other side of the frames. 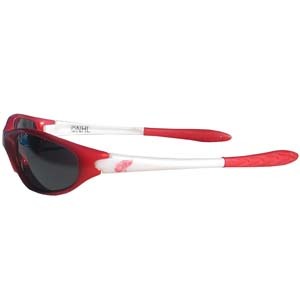 The Detroit Red Wings Sunglasses arms feature rubber team colored accents. Use this attractive Detroit Red Wings clip magnet to hold memos, photos or appointment cards on the fridge or take it down keep use it to clip bags shut. The Detroit Red Wings magnet features a silk screened Detroit Red Wings logo. This stainless steel 2 pc BBQ set is a tailgater's best friend. The colorful and large team graphics let's everyone know you are a fan! The set in includes a spatula and tongs with the Detroit Red Wings proudly display on each tool. 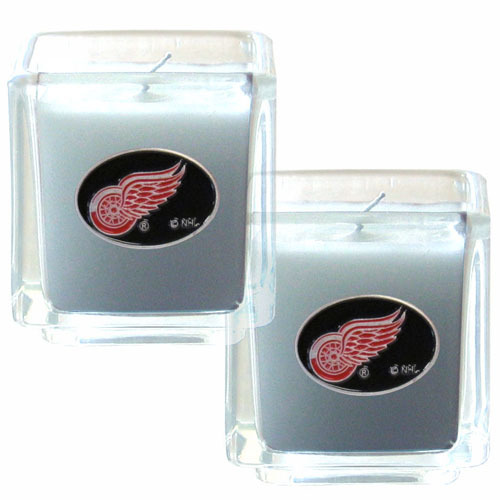 The NHL Detroit Red Wings Candle Set includes two 2" x 2" vanilla scented candles featuring a metal square with a hand enameled Detroit Red Wings emblem. Check out our extensive line of Detroit Red Wings NHL merchandise! 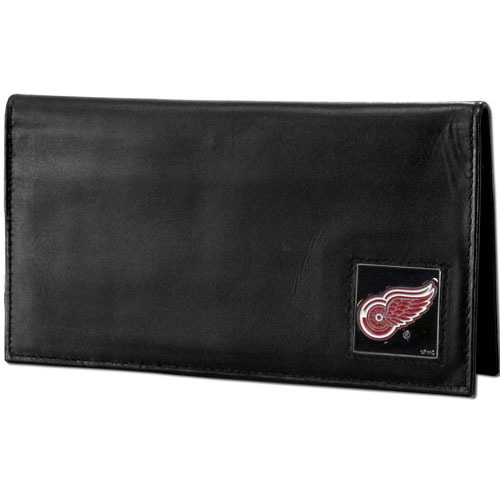 Officially licensed Detroit Red Wings NHL Bi-fold wallet is made of high quality fine grain leather and includes credit card slots and photo sleeves. Detroit Red Wings logo is sculpted and enameled with fine detail on the front panel. Officially licensed Detroit Red Wings Executive NHL Money Clip/Card Holders won't make you choose between paper or plastic because they stow both easily. 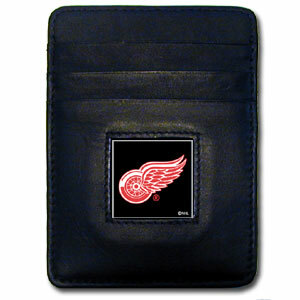 Features our sculpted and enameled Detroit Red Wings square on black leather Money Clip/Card Holder. 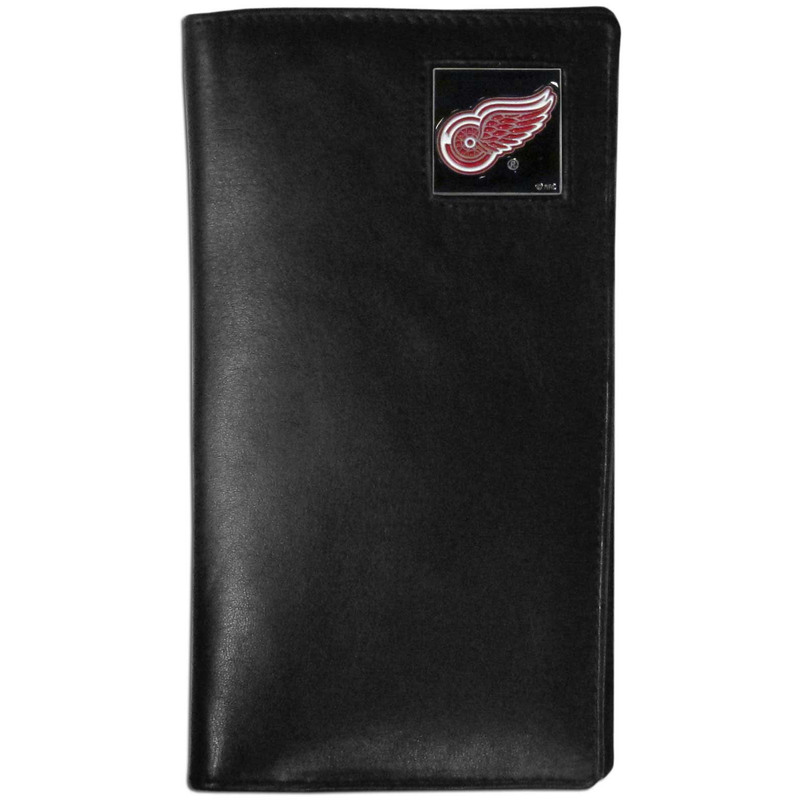 Detroit Red Wings deluxe NHL checkbook cover is made of high quality leather and includes a card holder, clear ID window, and inside zipper pocket for added storage. Detroit Red Wings logo square is sculpted and enameled with fine detail. Packaged in a window box that can be placed on a shelf or hung by a peg. This Detroit Red Wings genuine leather women's pocketbook features 9 credit card slots, a windowed ID slot, spacious front pocket, inner pocket and zippered coin pocket. 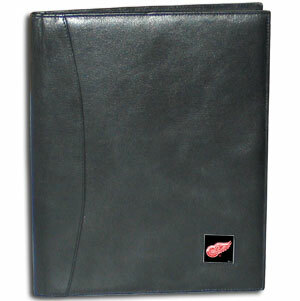 The front of the Detroit Red Wings pocketbook has a hand painted metal square with the Detroit Red Wings primary logo. 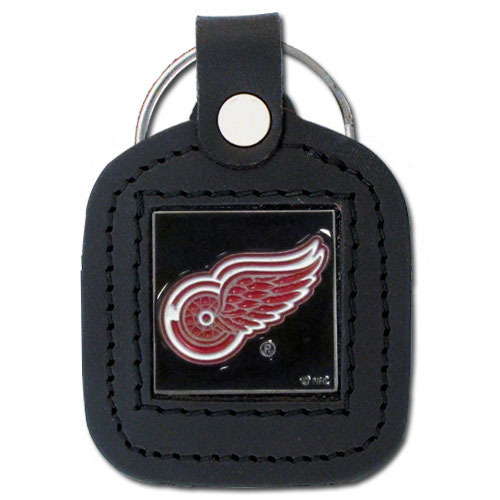 This square NHL Detroit Red Wings key ring features fine leather surrounding a sculpted and enameled Detroit Red Wings logo. Check out our entire line of Detroit Red Wings sports merchandise! NHL Detroit Red Wings checkbook cover is made of high quality leather includes inside pockets for added storage and plastic separator sheet for duplicate check writing. Detroit Red Wings logo square is sculpted and enameled with fine detail. Packaged in a window box. Officially licensed NHL Detroit Red Wings Oval Hitch cover is made of durable zinc and fits class II and class III hitch covers. NHL Detroit Red Wings Tri-fold wallet is made of high quality fine grain leather with Detroit Red Wings logo sculpted and enameled with fine detail on the front panel. NHL Detroit Red Wings Tri-fold wallet is made of high quality fine grain leather with Detroit Red Wings logo sculpted and enameled with fine detail on the front panel. Packaged in a window box. 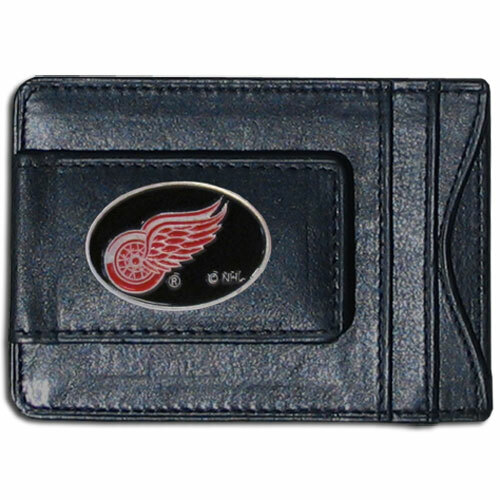 Officially licensed NHL Detroit Red Wings fine leather cash & cardholder is the perfect way to organize both your cash and cards while showing off your Detroit Red Wings spirit! Show off your Detroit Red Wings pride with our Detroit Red Wings family automotive decals. 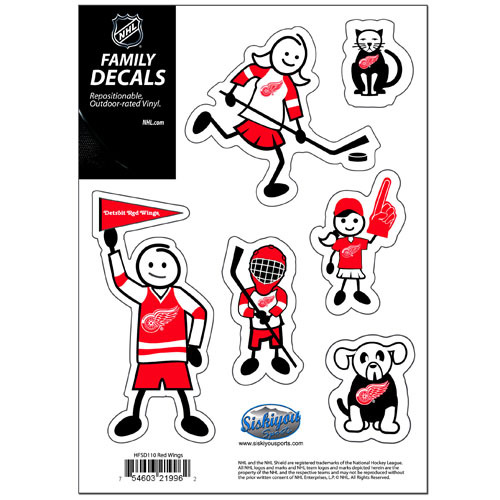 The Detroit Red Wings Small Family Decal Set includes 6 individual family themed decals that each feature the Detroit Red Wings logo. The 5" x 7" Detroit Red Wings Small Family Decal Set is made of outdoor rated, repositionable vinyl for durability and easy application. 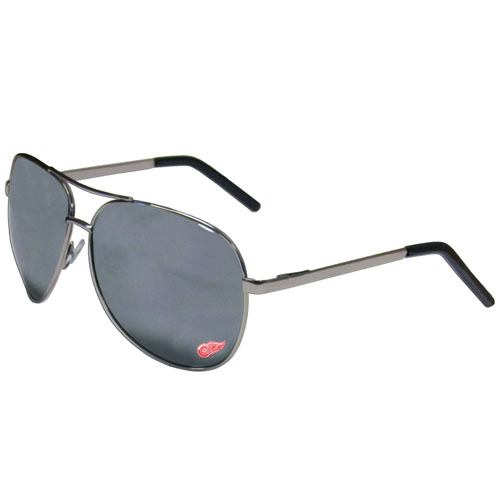 This stylish Detroit Red Wings aviator sunglasses have the iconic aviator style with mirrored lenses and metal frames. The Detroit Red Wings aviator sunglasses feature a silk screened Detroit Red Wings logo in the corner of the lense. 400 UVA/UVB protection. 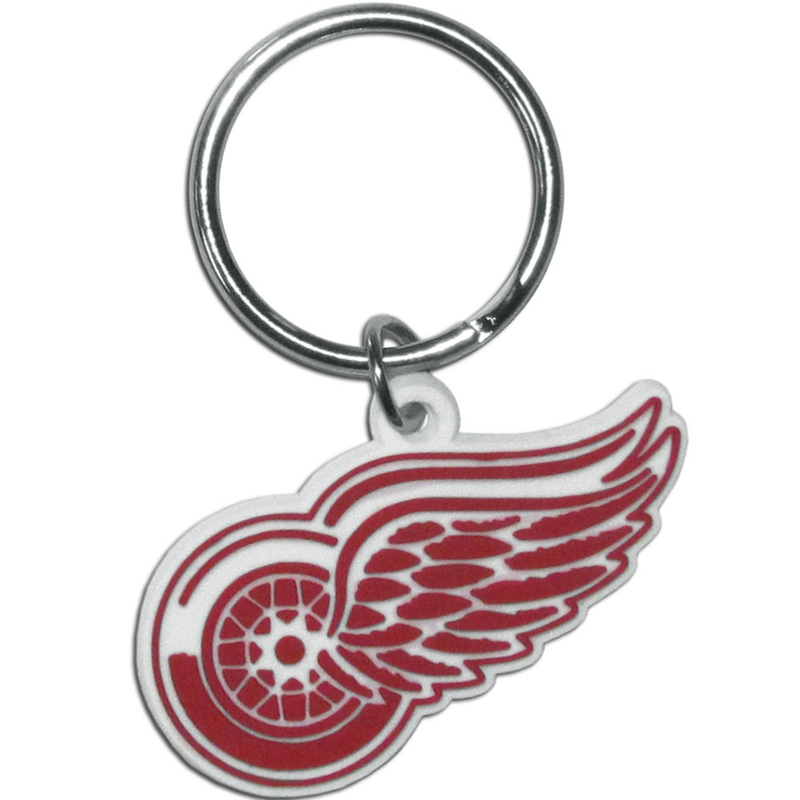 Officially licensed Detroit Red Wings chrome key chain is logo cut and enamel filled with a high polish chrome finish. 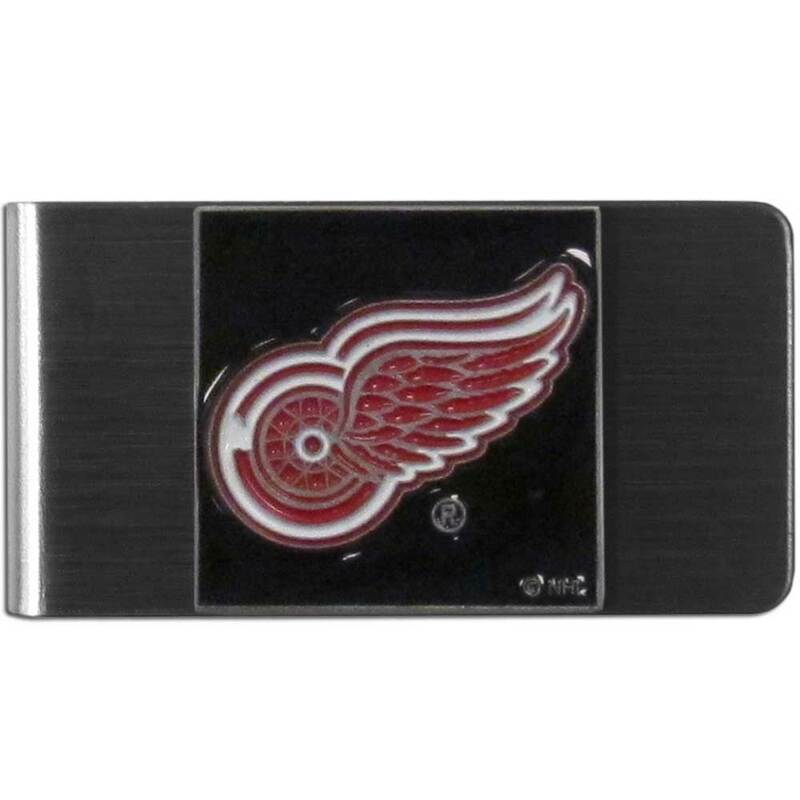 This quality NHL Detroit Red Wings Brushed Money Clip has a brushed metal finish and features a fully cast and hand enameled Detroit Red Wings logo. Our officially licensed Detroit Red Wings fine grain leather bi-fold wallet features numerous card slots, large billfold pocket and flip up window ID slot. This quality Detroit Red Wings wallet has an enameled Detroit Red Wings emblem on the front of the wallet. The Detroit Red Wings wallet is packaged in a gift box. 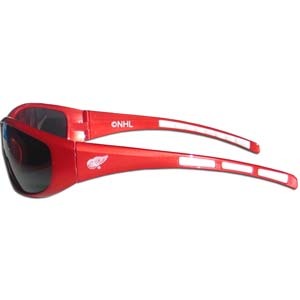 Officially licensed NHL Detroit Red Wings game day shades are the perfect accessory for the devoted Detroit Red Wings fan! The Detroit Red Wings game day shades have durable polycarbonate frames with flex hinges for comfort and damage resistance. The lenses feature brightly colored Detroit Red Wings clings that are perforated for visibility. 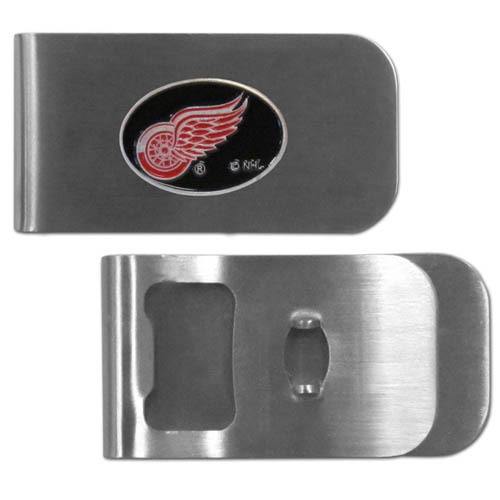 These unique Detroit Red Wings Bottle Opener Money Clip is made of heavy duty steel and has a functional bottle opener on the back. 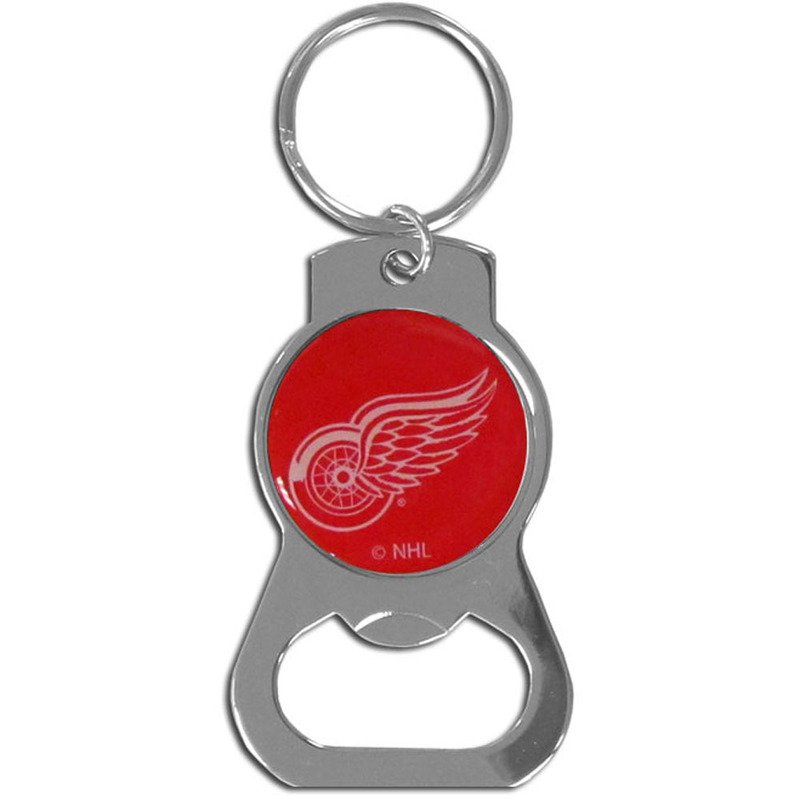 The Detroit Red Wings Bottle Opener Money Clip features a Detroit Red Wings emblem with enameled Detroit Red Wings colors. 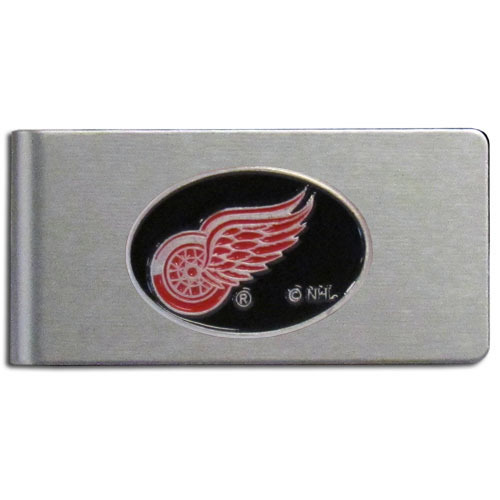 This Detroit Red Wings Bottle Opener Money Clip makes a great gift! These bright Detroit Red Wings Fan Bead Bracelet stretch to fit and feature a full metal Detroit Red Wings charm with enameled Detroit Red Wings details. Perfect, eye catching game day accessory. This Detroit Red Wings 3 pc Tailgater BBQ Set really catches your eye with flashy chrome accents and vivid Detroit Red Wings digital graphics. The 420 grade stainless steel tools are tough, heavy-duty tools that will last through years of tailgating fun. The Detroit Red Wings 3 pc Tailgater BBQ Set includes a spatula with a bottle opener and sharp serated egde, fork and tongs. This Officially licensed Detroit Red Wings Leather Money Clip/Card holder won't make you choose between paper or plastic because they stow both easily. 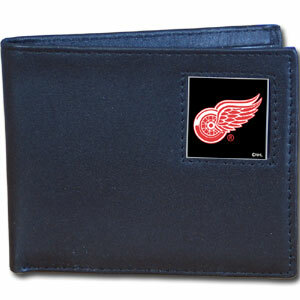 Features a sculpted and enameled Detroit Red Wings emblem on the front of the Leather Money Clip/Card holder. The Detroit Red Wings Leather Money Clip/Card holder is packaged in a gift box. 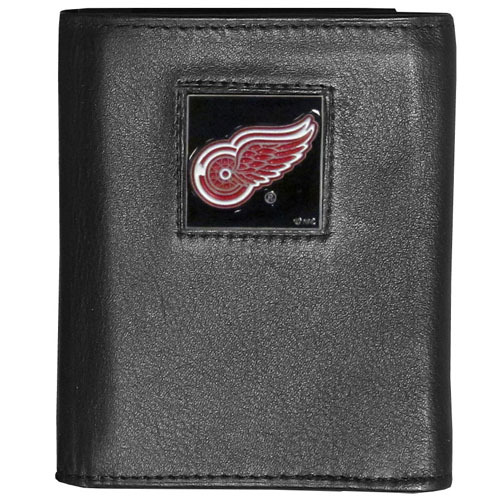 Officially licensed Detroit Red Wings fine grain leather wallet features numerous card slots, windowed ID slots, removable picture slots and large billfold pockets. This quality Detroit Red Wings wallet has an enameled Detroit Red Wings emblem on the front of the wallet. The Detroit Red Wings wallet is packaged in a gift box. This unique NHL Detroit Red Wings Nail Care Key Chain has 3 great functions! 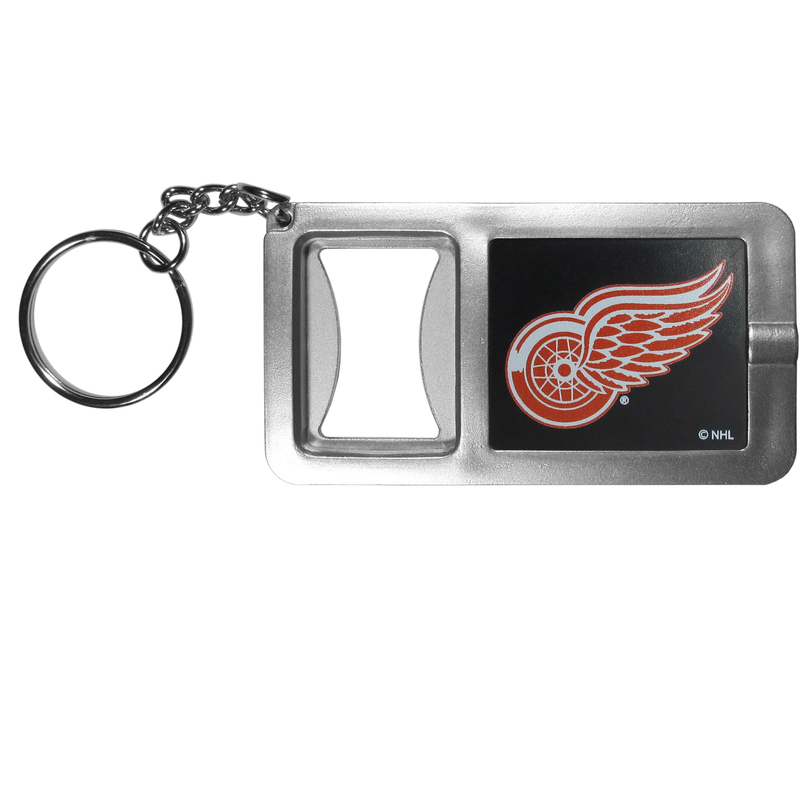 The Detroit Red Wings Nail Care Key Chain opens to become a nail clipper, when open you can access the nail file pad plus the Detroit Red Wings key chain also has a bottle opener. 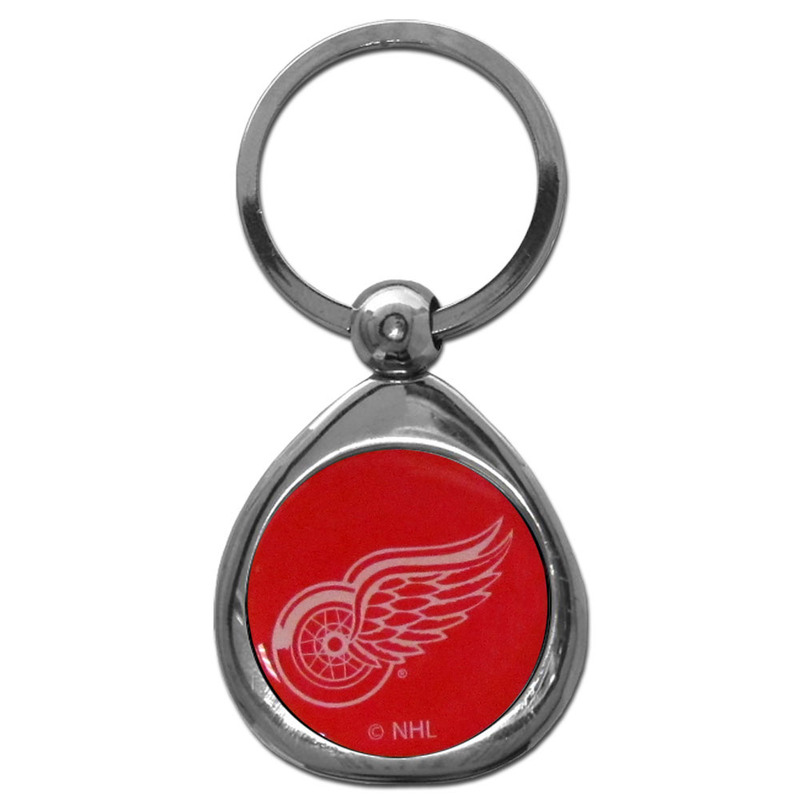 This Detroit Red Wings Nail Care Key Chain features a Detroit Red Wings domed logo. We have combined the wildly popular Euro style beads with your favorite team to create our Detroit Red Wings euro bead necklace. The 18 inch snake chain features 4 Euro beads with enameled Detroit Red Wings colors and rhinestone accents with a high polish, nickel free charm and rhinestone charm. Perfect way to show off your Detroit Red Wings pride. This attractive Detroit Red Wings iPad Air folio case provides all over protection for your tablet while allowing easy flip access. This Detroit Red Wings iPad Air Folio Case is designed to allow you to fully utilize your tablet without ever removing it from the padded, protective cover. 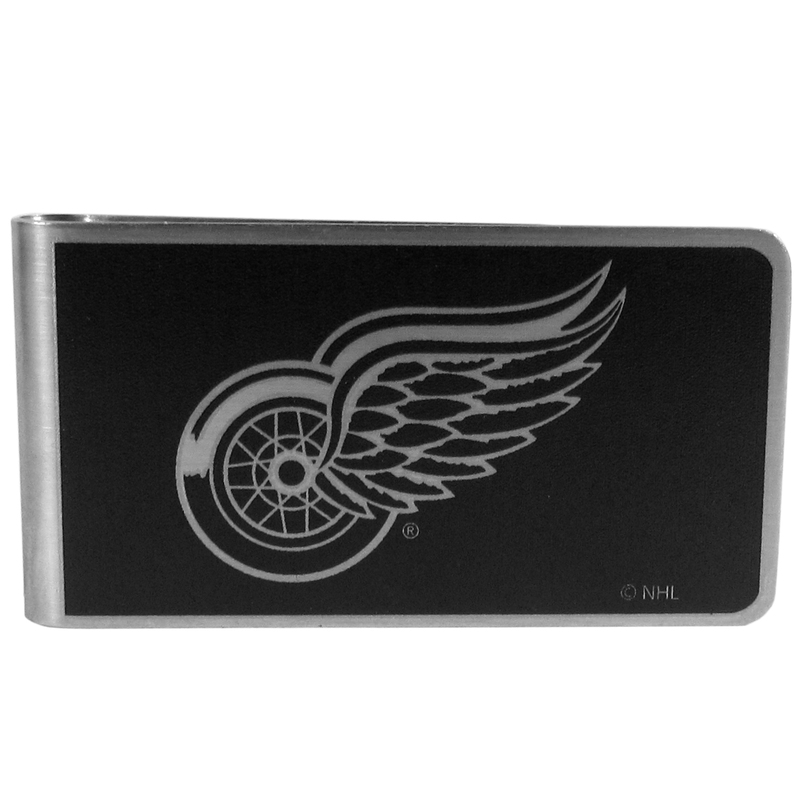 The enameled Detroit Red Wings emblem makes this case a great way to show off your Detroit Red Wings pride! Our NHL Detroit Red Wings Crystal Dangle Earrings are the perfect accessory for your game day outfit! The Detroit Red Wings Crystal Dangle Earrings are approximately 1.5 inches long and feature an iridescent crystal bead and nickel free chrome Detroit Red Wings charm on nickel free, hypoallergenic fishhook posts. 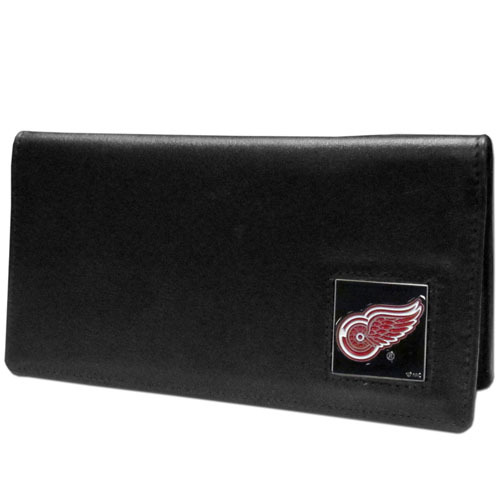 This officially licensed tall leather wallet cover is made of high quality leather with a fully cast metal Detroit Red Wings emblem with enameled Detroit Red Wings color detail. The cover fits both side and top loaded checks and includes a large zippered pocket, windowed ID slot, numerous credit card slots and billfold pocket. NHL Detroit Red Wings oversized belt buckle is a carved metal buckle with enameled Detroit Red Wings colors. Features fine detailing and distinctive background. The Detroit Red Wings Oversized Buckle measure 4 x 3 3/8". Officially licensed Detroit Red Wings crystal bead bracelet with Detroit Red Wings colored crystal separated with chrome helix beads. 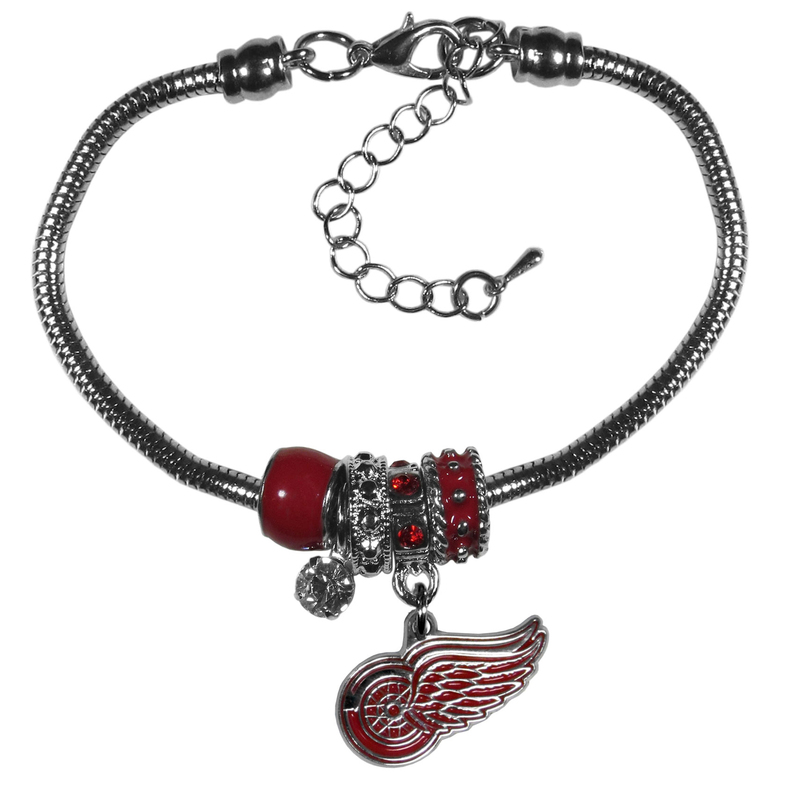 The Detroit Red Wings Crystal Bead Bracelet features a Detroit Red Wings charm with exceptional detail. 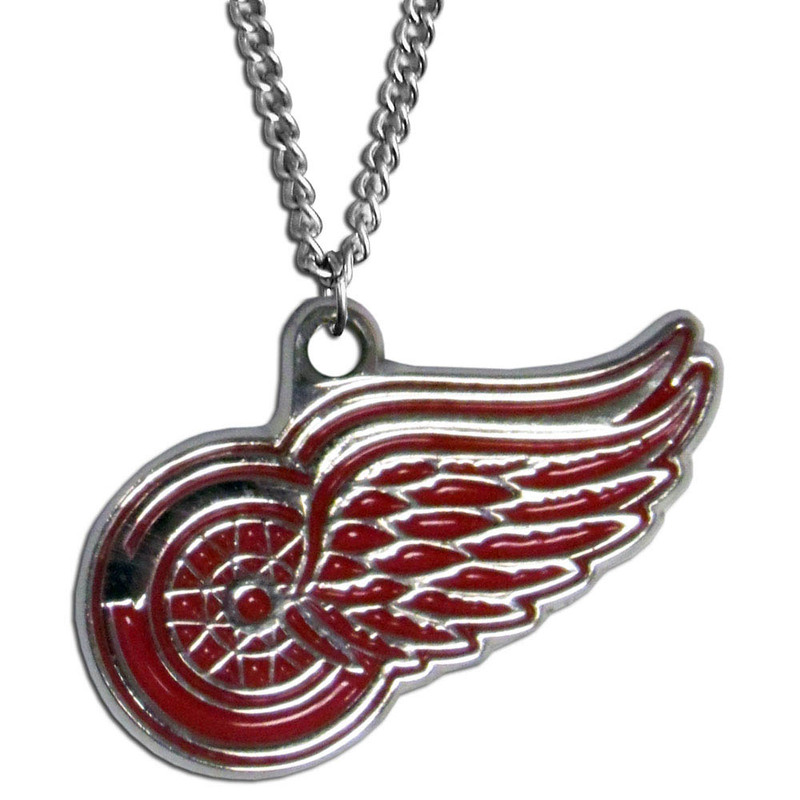 Make a statement with our NHL Detroit Red Wings Chain Necklace with Small Charm. The 20 inch Detroit Red Wings Chain Necklace with Small Charm features a fully cast, high polish Detroit Red Wings pendant with vivid enameled Detroit Red Wings details. Perfect accessory for a Detroit Red Wings game day and nice enough to wear everyday! Our officially licensed black wrap sunglasses are a sleek and fashionable way to show off your Detroit Red Wings pride. The quality frames are accented with chrome shield on each arm that has a laser etched team logo. The frames feature flex hinges for comfort and durability and the lenses have the maximum UVA/UVB protection. Instantly become a team VIP with these colorful wrist bands! These are not your average, cheap stretch bands the stretch fabric and dye sublimation allows the crisp graphics and logo designs to really pop. A must have for any Detroit Red Wings fan! Make sure everyone knows your are a fan with our big 8 inch Detroit Red Wings logo magnets. These officially licensed magnets stick to any magnetic metal and our outdoor rated! Perfect for game day and everyday! 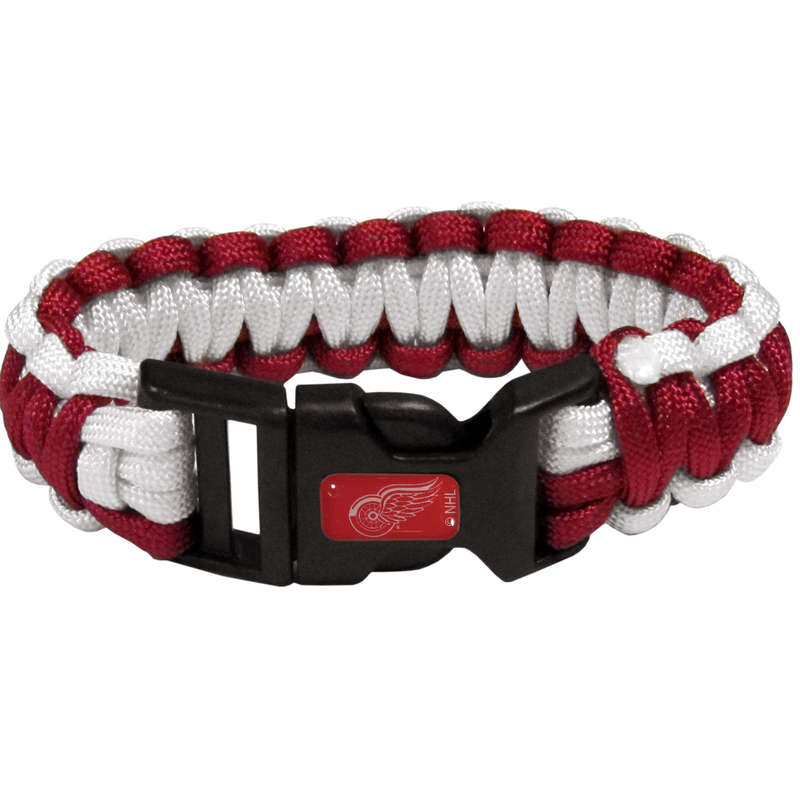 Our functional and fashionable Detroit Red Wings camo survivor bracelets contain 2 individual 300lb test paracord rated cords that are each 5 feet long. The camo cords can be pulled apart to be used in any number of emergencies and look great while worn. The bracelet features a team emblem on the clasp. Our officially licensed I Heart game day shades are the perfect accessory for the devoted Detroit Red Wings fan! The sunglasses have durable polycarbonate frames with flex hinges for comfort and damage resistance. The lenses feature brightly colored team clings that are perforated for visibility. This heavy-duty steel opener is extra long, with a durable vinyl covering. 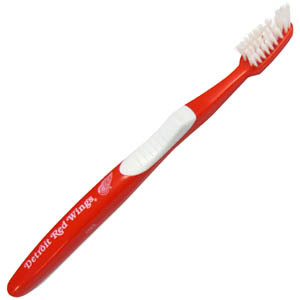 The extra length provides more leverage for speed opening and the opener features a large printed Detroit Red Wings logo. Show off your team pride with our officially licensed Detroit Red Wings tongue ring. The 1 inch barbell features a photo epoxy inlay logo. Our large hoop earrings have a fully cast and enameled Detroit Red Wings® charm with enameled detail and a high polish nickel free chrome finish and rhinestone access. Hypoallergenic fishhook posts. Our Detroit Red Wings® stainless steel 3 pc BBQ tool set includes a large spatula with built in bottle opener, heavy duty tongs, and large fork. All the tools feature a team logo on the handle. The set comes with a durable canvas bag that has a chrome accented team logo. This is the ultimate Detroit Red Wings® tailgate accessory! The high quality, 420 grade stainless steel tools are durable and well-made enough to make even the pickiest grill master smile. This complete grill accessory kit includes; 4 skewers, spatula with bottle opener and serrated knife edge, basting brush, tongs and a fork. The 18 inch metal carrying case makes this a great outdoor kit making grilling an ease while camping, tailgating or while having a game day party on your patio. The tools are 17 inches long and feature a metal team emblem. The metal case features a large, metal team emblem with exceptional detail. This high-end men's gift is sure to be a hit as a present on Father's Day or Christmas. Our beachfarer sunglass feature the Detroit Red Wings® logo and name silk screened on the arm of these great retro glasses. 400 UVA protection. Our monochromatic steel money clips have a classic style and superior quality. The strong, steel clip has a black overlay of the Detroit Red Wings® logo over the brushed metal finish creating a stylish men's fashion accessory that would make any fan proud. 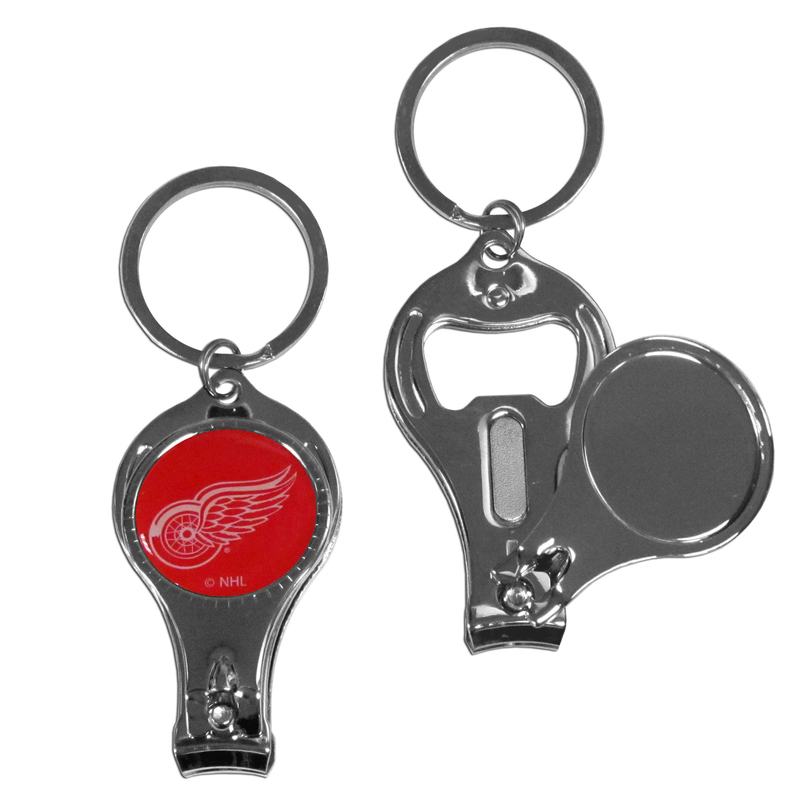 Hate searching for a bottle opener, get our Detroit Red Wings® bottle opener key chain and never have to search again! The high polish key chain features a bright team emblem. Make a statement with our chain necklaces. 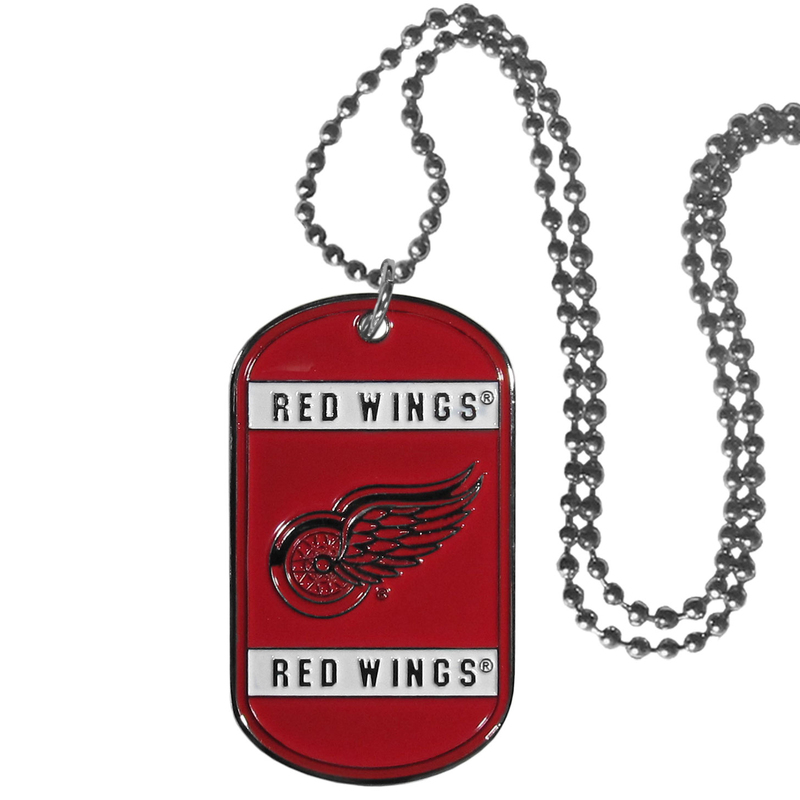 The 22 inch chain features a fully cast, metal Detroit Red Wings® pendant with vivid enameled details. Perfect accessory for game day and nice enough to wear everyday! Our classic single charm bracelet is a great way to show off your team pride! 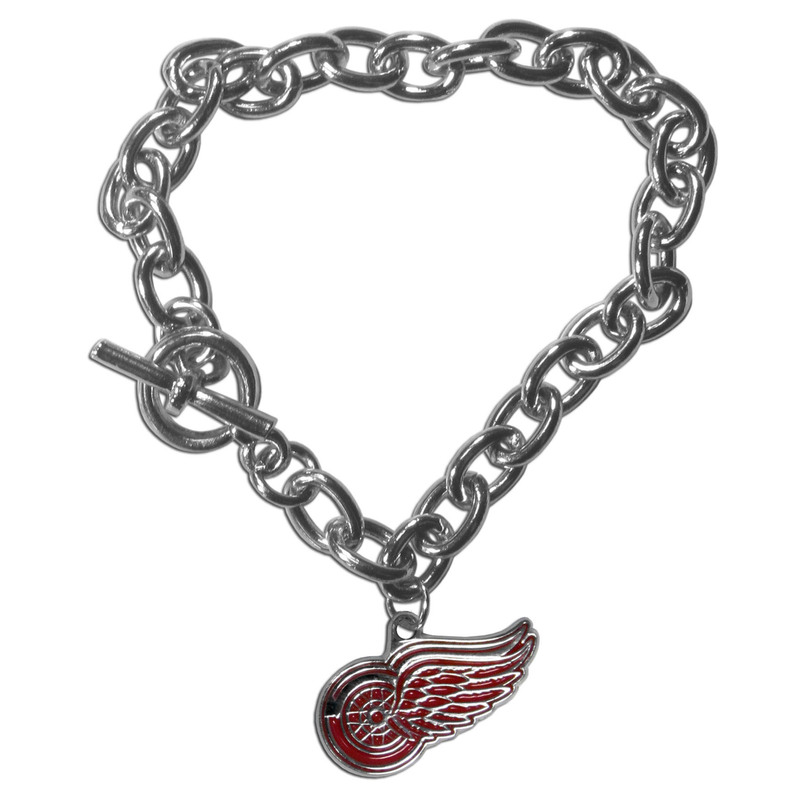 The 7.5 inch large link chain features a high polish Detroit Red Wings® charm and features a toggle clasp which makes it super easy to take on and off. Use this attractive clip magnet to hold memos, photos or appointment cards on the fridge or take it down keep use it to clip bags shut. 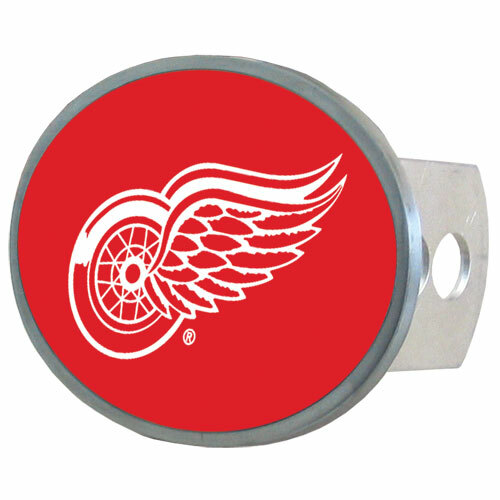 The magnet features a domed Detroit Red Wings® logo. Our officially licensed chrome dangle earrings have fully cast Detroit Red Wings® charms with exceptional detail and a hand enameled finish. The earrings have a high polish nickel free chrome finish and hypoallergenic fishhook posts. 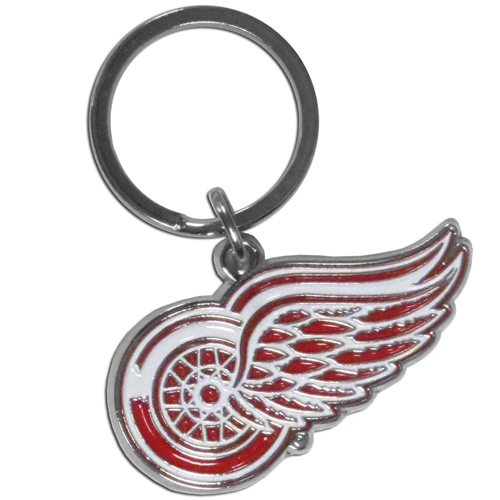 Our stylish, high-polish Detroit Red Wings® key chain is a great way to carry your team with your. The key fob features a raised team dome. Dog tag necklaces are a fashion statement that is here to stay. The sporty version of the classic tag features a black printed over a high polish tag to create a bold and sporty look. The tag comes on a 26 inch ball chain with a ball and joint clasp. Any Detroit Red Wings® would be proud to wear this attractive fashion accessory. These comfortable and fashionable double-bar cuff bracelets feature a 1 inch metal Detroit Red Wings® inset logo with enameled detail. 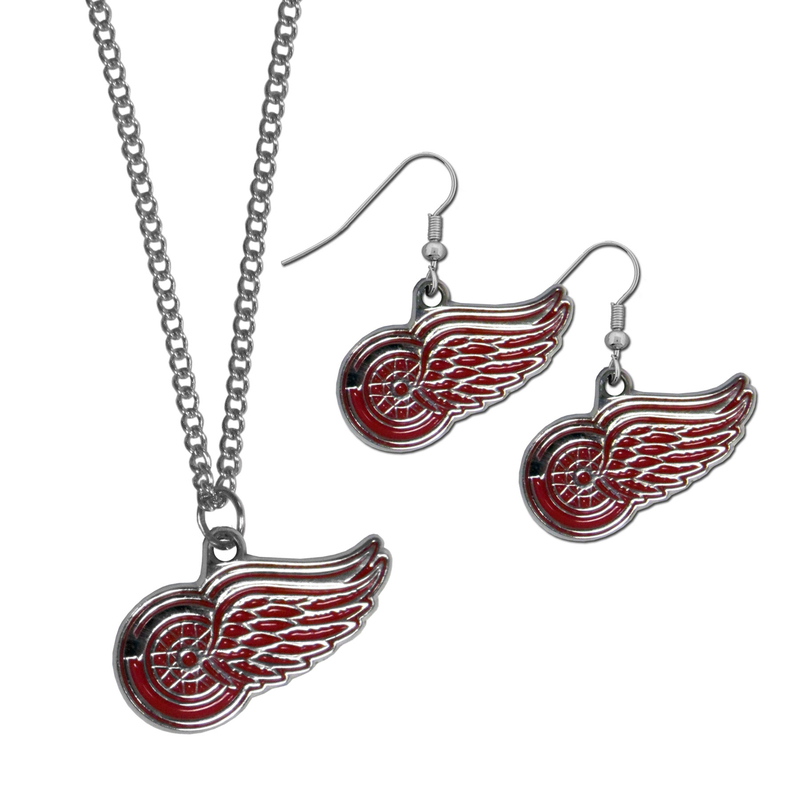 This classic jewelry set contains are most popular Detroit Red Wings® dangle earrings and 22 inch chain necklace. The trendy, dangle earrings are lightweight and feature a fully cast metal team charm with enameled team colors. The matching necklace completes this fashion forward combo and is a spirited set that is perfect for game day but nice enough for everyday. We have combined the wildly popular Euro style beads with your favorite team to create our Detroit Red Wings® bead bracelet. The 7.5 inch snake chain with 2 inch extender features 4 Euro beads with enameled team colors and rhinestone accents with a high polish, nickel free charm and rhinestone charm. Perfect way to show off your team pride. 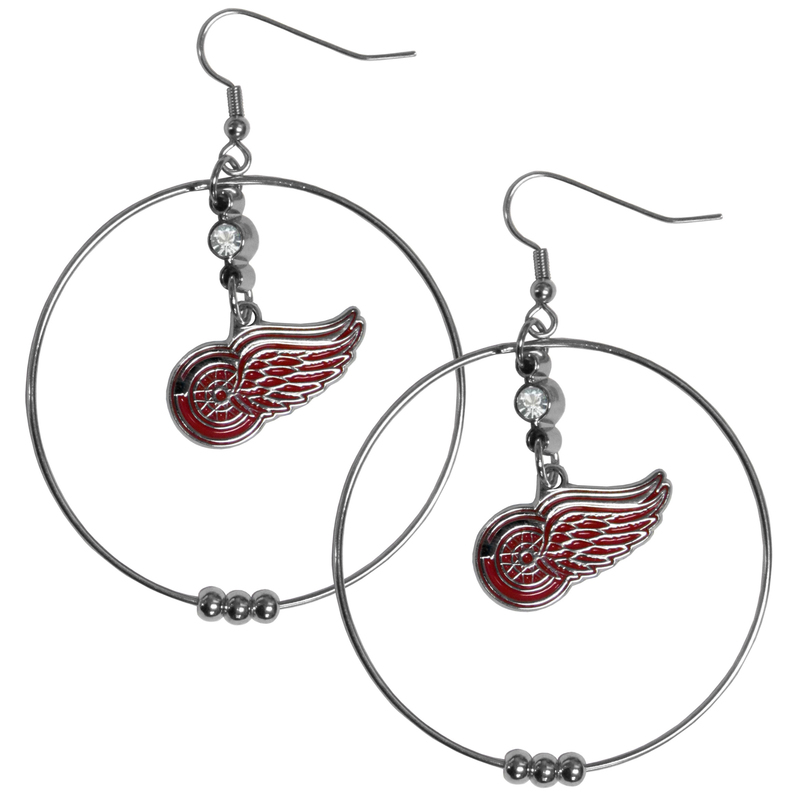 Love your team, show it off with our Detroit Red Wings® bead dangle earrings! These super cute earrings hang approximately 2 inches and features 2 team colored beads and a high polish team charm. A must have for game day! This fun and colorful Detroit Red Wings® fan bead jewelry set is fun and casual with eye-catching beads in bright team colors. The fashionable dangle earrings feature a team colored beads that drop down to a carved and enameled charm. The stretch bracelet has larger matching beads that make a striking statement and have a matching team charm. These sassy yet sporty jewelry pieces make a perfect gift for any female fan. Spice up your game-day outfit with these fun colorful earrings and bracelet that are also cute enough for any day. 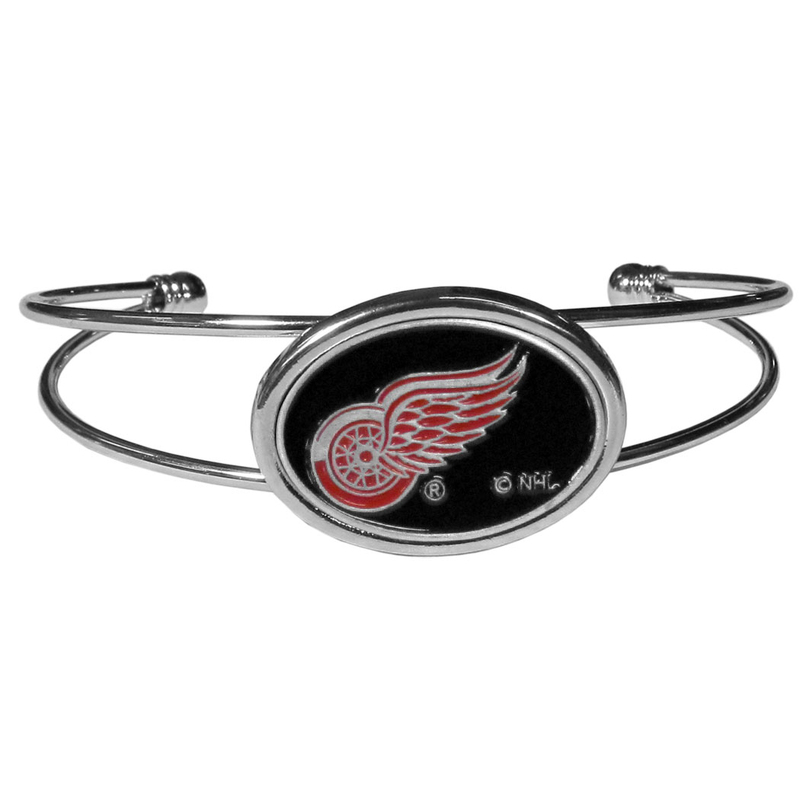 Our Fan Bracelet is a one size fits all string cuff bracelets with a screen printed ribbon with the team Detroit Red Wings® name and logo. 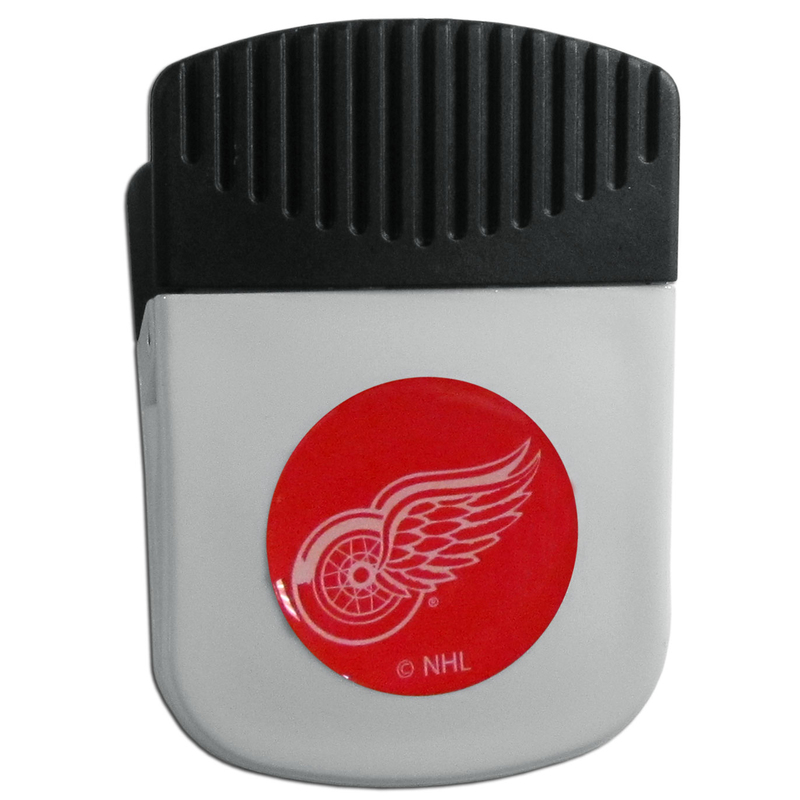 Never be without light with our Detroit Red Wings® flashlight keychain that features a handy bottle opener feature. This versatile key chain is perfect for camping and travel and is a great way to show off your team pride! 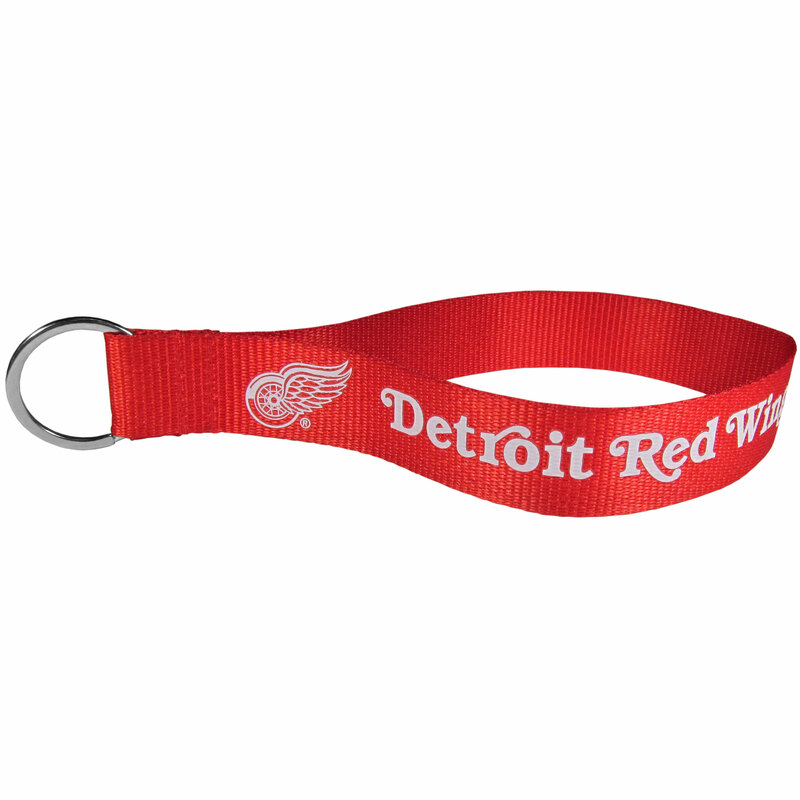 Our fun, flexible Detroit Red Wings® key chains are made of a rubbery material that is layered to create a bright, textured logo. It's a home state decal with a sporty twist! 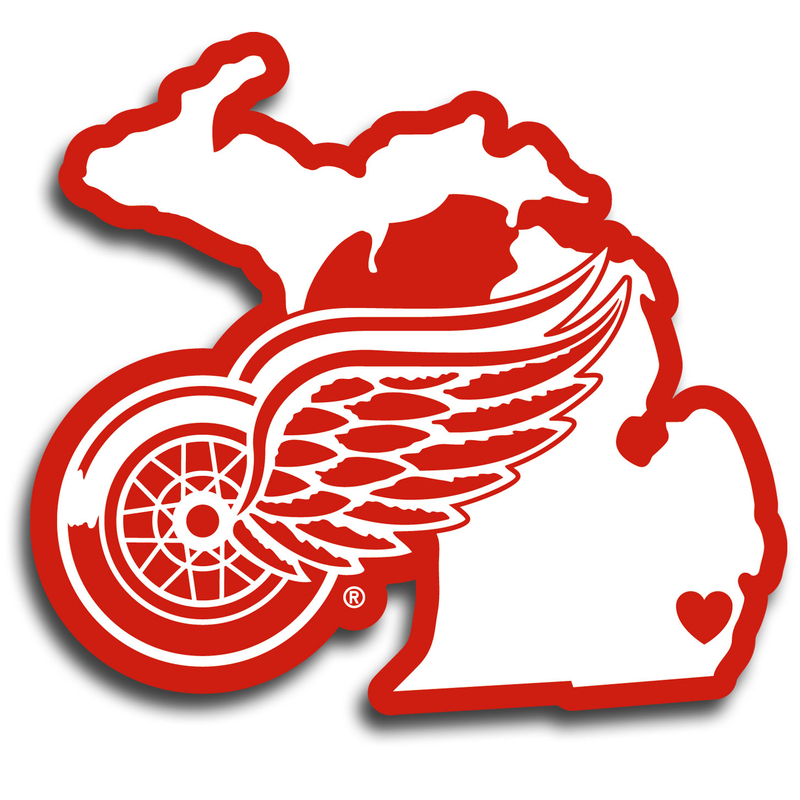 This Detroit Red Wings® decal feature the team logo over a silhouette of the state in team colors and a heart marking the home of the team. The decal is approximately 5 inches on repositionable vinyl. This retro, knotted choker is a cool and unique piece of fan jewelry. 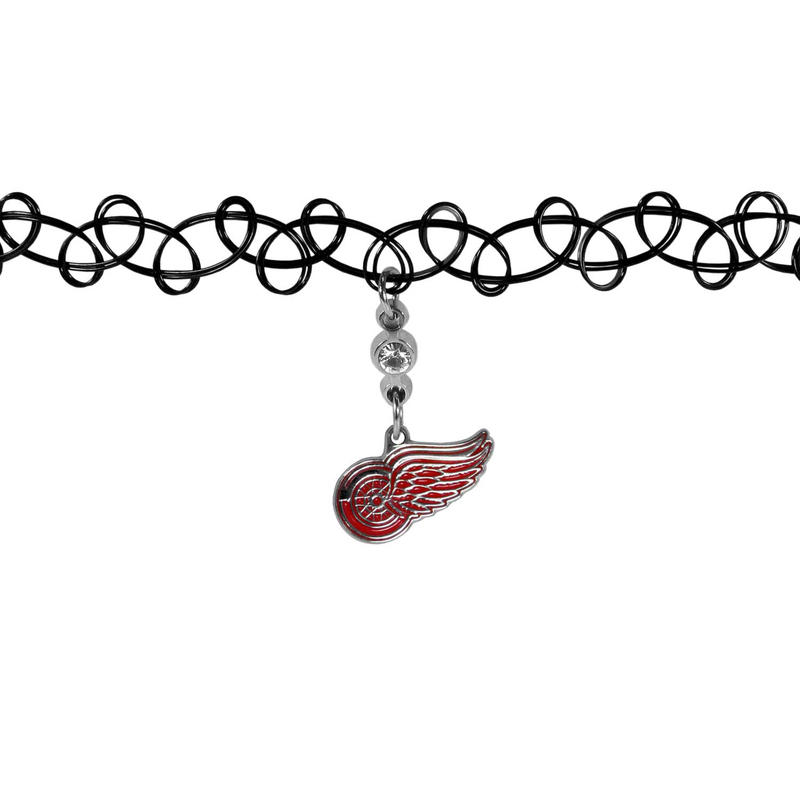 The tattoo style choker features a high polish Detroit Red Wings® charm with rhinestone accents. Our wrist strap lanyard key chain is made of durable and comfortable woven material and is a not only a great key chain but an easy way to keep track of your keys. The bright Detroit Red Wings® graffics makes this key chain easy to find in gym bags, purses and in the dreaded couch cushions. Our leather and canvas padfolio perfectly blends form and function. The attractive portfolio is bound in fine grain leather with an attractive canvas finish and the interior is a soft nylon. 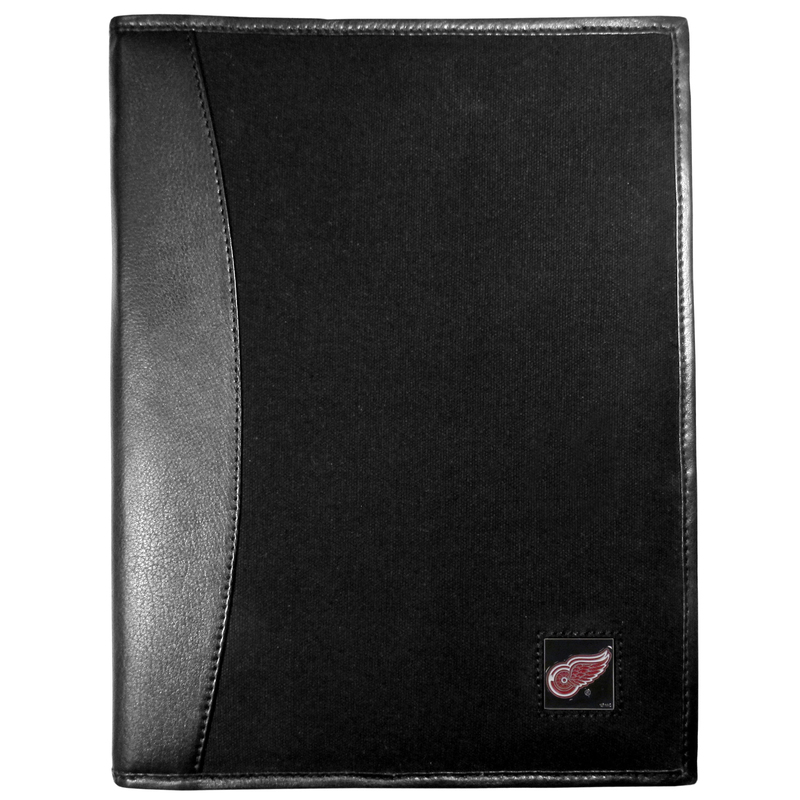 This high quality business accessory also features a fully cast metal Detroit Red Wings® emblem that is subtly set in the corner of the organizer. It is packed with features like 6 card slots for badges, business cards, hotel keys or credit cards and ID with a large pocket for loose papers and a writing tablet slot making it a must-have for the professional on the go. This cool new style wallet features an inner, metal bill clip that lips up for easy access. The super slim wallet holds tons of stuff with ample pockets, credit card slots & windowed ID slot. 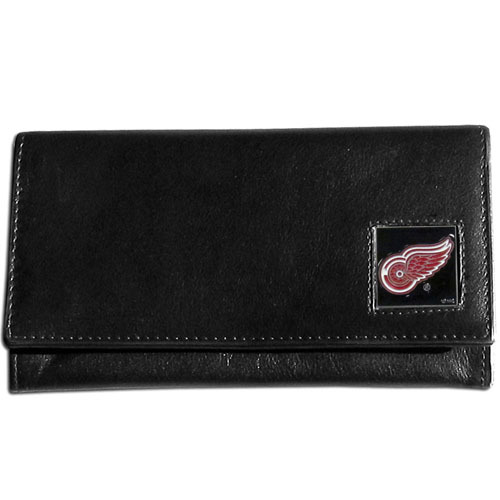 The wallet is made of genuine fine grain leather and it finished with a metal Detroit Red Wings® emblem. The wallet is shipped in gift box packaging. This officially licensed, innovative jacob's ladder wallet design traps cash with just a simple flip of the wallet! There are also outer pockets to store your ID and credit cards. 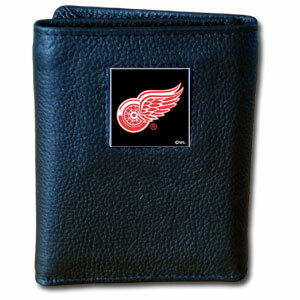 The wallet is made of fine quality leather with a fully cast & enameled Detroit Red Wings® emblem on the front. Our Detroit Red Wings® leather tri-fold wallet features a sculpted and hand painted team square on a black leather tri-fold. Includes an ID window, slots for credit cards and clear plastic photo sleeves. For a sporty feel, the liner of the wallet is made with a canvas liner. 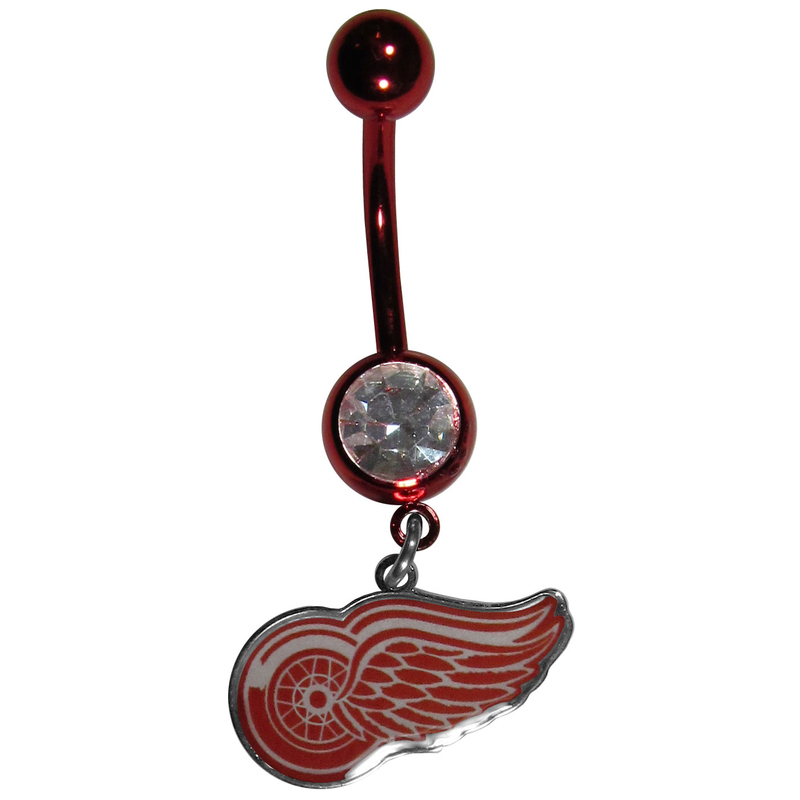 Let the world know you’re a fan with our officially licensed Detroit Red Wings® belly ring in vibrant team colors with a large, team colored crystal. The 14 gauge navel ring is 316L Surgical Stainless steel has a team dangle charm. This unique hitch cover features a large Detroit Red Wings® logo. If you have ever hooked up a trailer or boat your have probably smashed your shins on the ball hitch a few times. This revolutionary shin shield hitch cover provides your much abused shins with the protection they deserve! The tough rubber hitch is rated to work with Class V hitch receivers hauling up to 17,000 gross trailer weight and 1,700 tongue weight allowing you to leave it on while hauling. 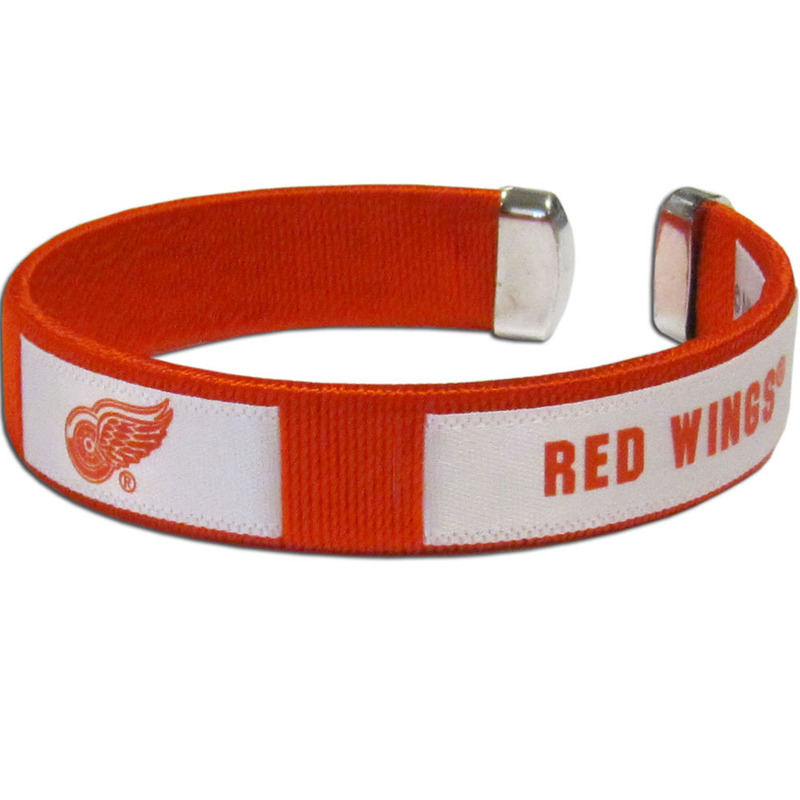 Our functional and fashionable Detroit Red Wings® survivor bracelets contain 2 individual 300lb test paracord rated cords that are each 5 feet long. The team colored cords can be pulled apart to be used in any number of emergencies and look great while worn. The bracelet features a team emblem on the clasp. Expertly crafted Detroit Red Wings® tag necklaces featuring fine detailing and a hand enameled finish with chrome accents. 26 inch chain. 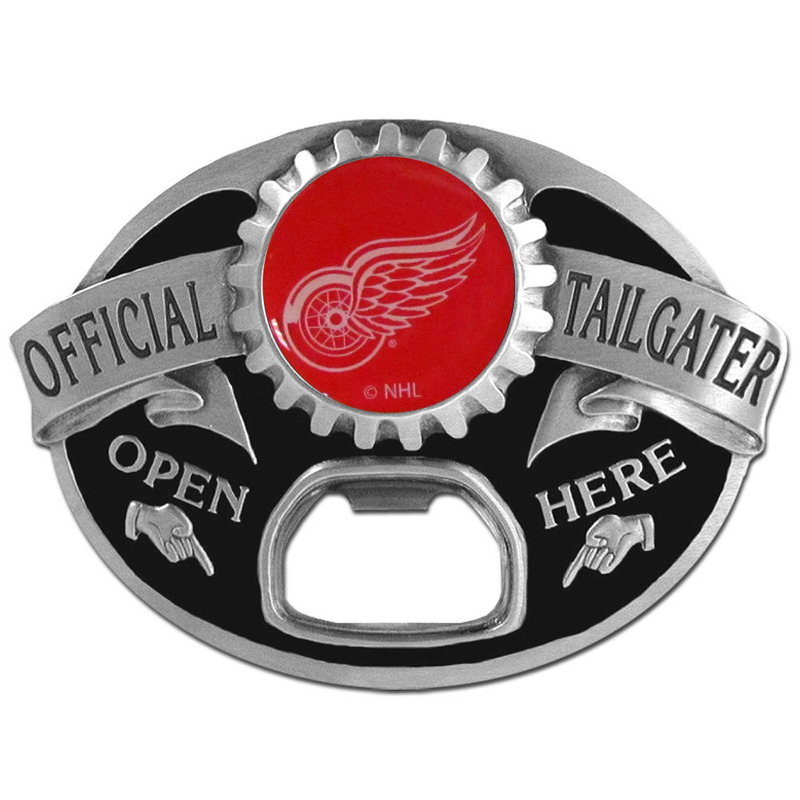 Quality detail and sturdy functionality highlight this great tailgater buckle that features an inset domed emblem Detroit Red Wings® dome logo and functional bottle opener. 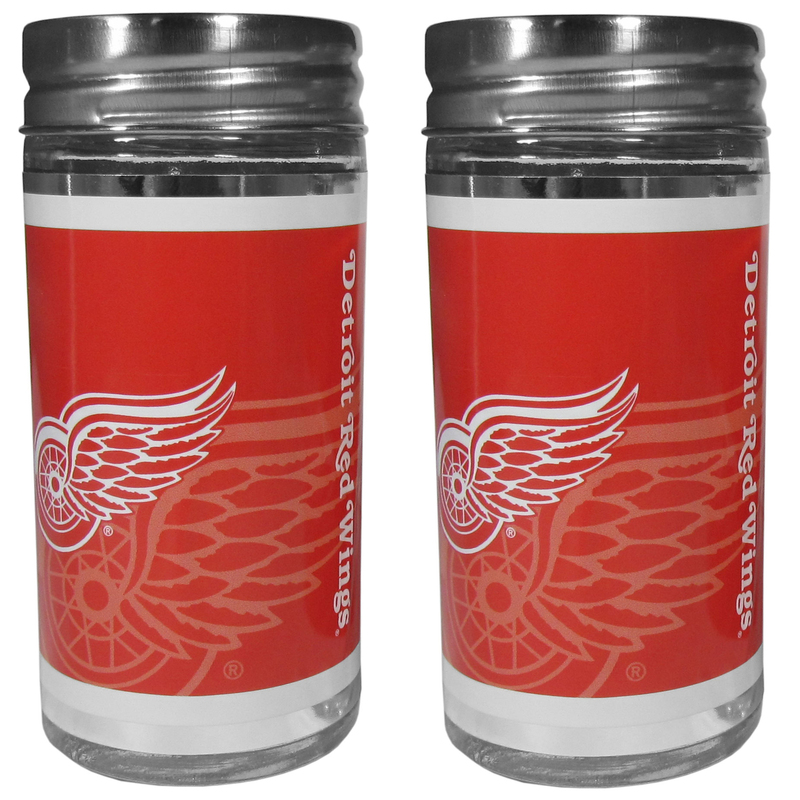 No tailgate party is complete without your Detroit Red Wings® salt & pepper shakers featuring bright team graphics. The glass shakers are 3.75 inches tall and the screw top lids have holes that spell out P and S. These team shakers are a great grill accessory whether you are barbecuing on the patio, picnicing or having a game day party. 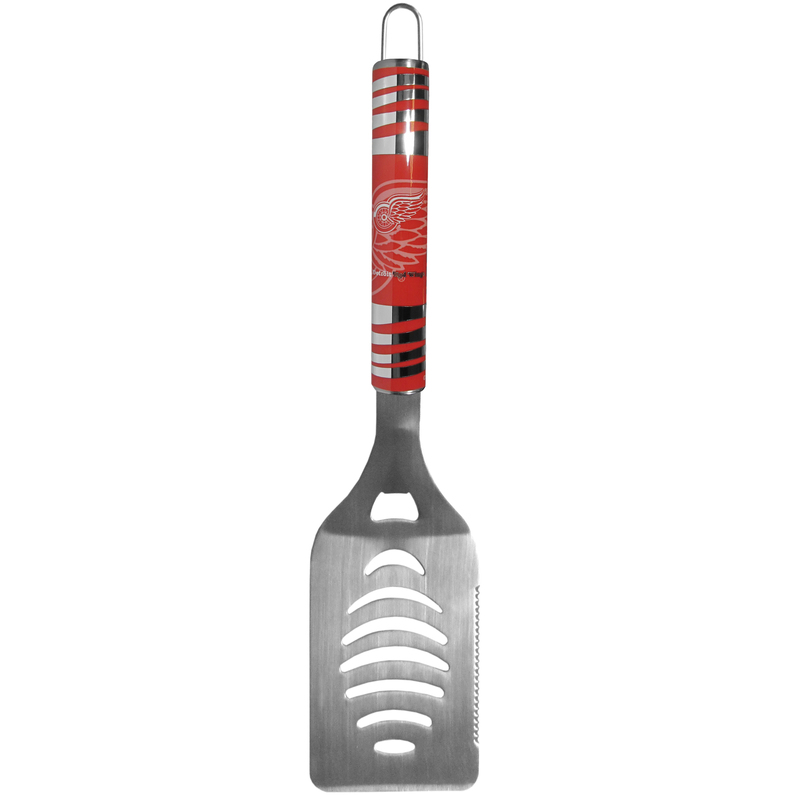 Our tailgater spatula really catches your eye with flashy chrome accents and vivid Detroit Red Wings® digital graphics. The 420 grade stainless steel spatula is a tough, heavy-duty tool that will last through years of tailgating fun. The spatula features a bottle opener and sharp serrated edge. Dog tag necklaces are a fashion statement that is here to stay. The sporty version of the classic tag features a gradient print in team colors featuring a full color team logo over a high polish tag to create a bold and sporty look. The tag comes on a 26 inch ball chain with a ball and joint clasp. Any Detroit Red Wings® would be proud to wear this attractive fashion accessory.